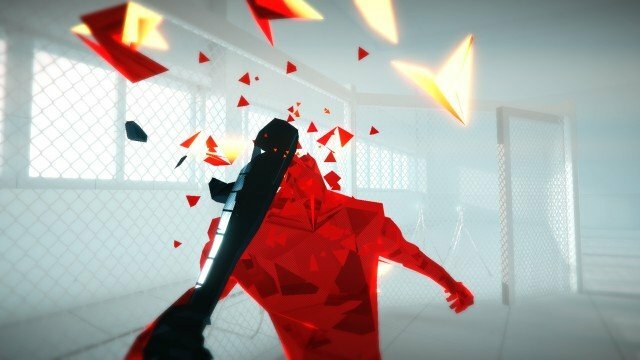 Superhot is a very unique take on the first-person shooter genre, and one that deserves attention. Although it's short and has some issues, it's a welcomed addition to the Xbox One's games library. Although some complain that the first-person shooter genre has become too cluttered with similar looking, sounding and playing war games, those who write it off entirely as a result of this are doing themselves a disservice. Sure, there are many war-based shooters out there (some good, some great and some bad), but that doesn’t mean that other companies aren’t trying their hand at different takes on the bullet-filled genre. 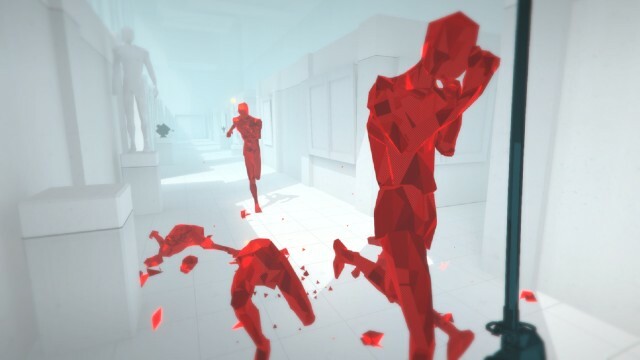 After all, that’s what led to Superhot, a critically-acclaimed former PC exclusive that has now made its way to the Xbox One. 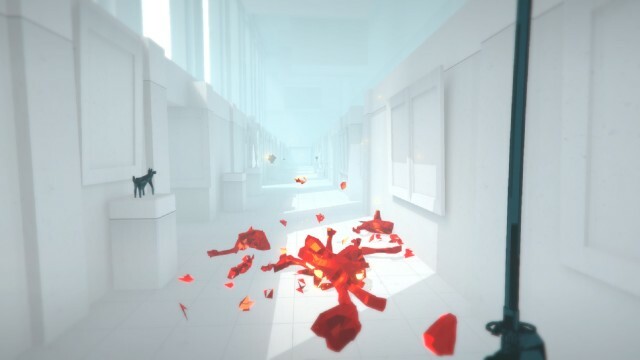 Minimalistic and unique, Superhot is a game that centres upon time manipulation. Stand still and time does, too. Move, and it follows suit, though its speed is dependent on yours. The idea may be simple in a way that makes you exclaim, “I could’ve thought of that!” but there’s no denying that it’s smart. It works well in action, too, creating an experience that stands on its own two feet and presents a unique take on interactive gunplay. There is a story to be found here, but it’s strange and basic at the same time. We play as some sort of IT professional, or part-time hacker, whose friend sends him an instant message about a badass game stored on a company’s easy-to-access server. 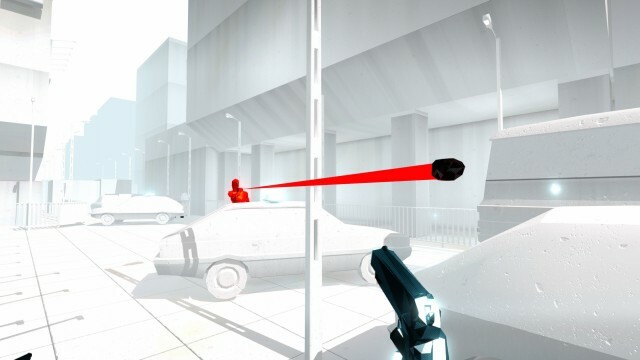 Said game is called (and referred to as) Superhot. After exchanging a few text messages, the friend sends our protagonist the files needed to access the game. Once they finish downloading, he launches the .exe file and does so without knowing that this action will forever change his life. Superhot, itself, is presented in-game as a retro computer title. It loads in full-screen, but plays in widescreen, thanks to the fact that it’s experienced through a virtual reality headset. Performance-wise, it’s a bit up and down, because it seems to be a work-in-progress, and glitches are a current normality. Upon launching the game, we’re thrown right into the action, in a white walled, floored and ceilinged world, which has only two accent colours: black and red. Black signifies weapons that can be picked up and environmental items that can be thrown at enemies, whereas red is the colour of your foes. Everything outside of those items and digitized creatures is white, which helps to create a very sterile and minimalistic look that will remain memorable. Everything occurs through a first-person viewpoint, as the player moves his way through seemingly random levels and environments while dealing with incoming hostiles. Dispatching of these asshats isn’t as easy as in other shooters, though, because you really need to be mindful of your surroundings and time, itself. It’s all a puzzle, if you will. Trial and error play a big role in Superhot, and it’s the game’s difficulty that helps extend its runtime. In total, I had put about two to two-and-a-half hours in before the credits rolled, and I died a decent amount of times over those one hundred and twenty to one hundred and fifty minutes. That seems to be the average playtime for those who completed the PC version, though. To succeed and beat missions without multiple retries, you must be smart about what you do. Ammunition is limited, as each gun only has a few shots or bursts up its sleeve, and using your guns and melee weapons effectively is important. If you miss a shot, that not only means that you’ve lost a bullet and will have to wait for an automatic reload; it also means that you’ve given the enemy more time. Not only that, but in a game where it’s important to avoid missing, doing so can lead to you becoming outnumbered as more enemies spawn around you. The best way to approach things is to think of the levels in step-by-step fashion, or like a symphony. You’re always given enough to best each foe and complete each situation, but you’ll need to be mindful of how you use said items. If an enemy is approaching and you’re all out of bullets, throw your gun so that he’s knocked off balance and drops his own weapon, then move forward and steal the gun before it hits the ground. Conversely, if you’re using a katana and see gun-toting enemies in the distance, you might want to sacrifice that sword by throwing it at one of those foes. One hit kills enemies, and the same is true of you. There is no health in this game, so every bullet must be dodged using time as an ally. It might take a bit before you get the hang of how things work in Superhot, but it’s worth the investment. This is a unique take on the first-person shooter genre, and being able to manipulate time is a great asset. Sure, it can be cheap at times, but there’s an interesting experience on offer here, and one that gives you endless and challenge modes upon completion of its main campaign. Now, when it comes to how Superhot performs on Xbox One: while there were no major issues, I did encounter some glitches. At least, what seemed to be glitches. It’s hard to tell because the in-game version of Superhot is supposed to be an unfinished and glitchy affair in and of itself. For starters, some after death loading screens were noticeably longer than others. There was also a time where the game took a while to load a level and made the loud buzzing sound that accompanies an Xbox One game crash while doing so. I thought it had crashed, for sure, but was happy to see that it hadn’t. Furthermore, when I paused the game at one point, it somehow glitched and got rid of my progress, forcing me to replay two challenging levels that I had previously completed. Despite its glitches and brief length, Superhot remains well worth checking out. Not only is it an interesting deviation from the norm, but it’s also a memorable affair that will have people coming back for more, thanks to its open-ended levels, post-completion challenge modes and the high that comes with completing a tough encounter. It does, however, feel like an appetizer before a meatier main course that we will hopefully get to experience in the relatively near future.